I haven’t felt the need to replace my original Sony RX100 until now. The new AF system in the Sony RX100 V and 4k video quality has just about convinced me to finally upgrade. Mirrorlessons makes some of my favorite early videos for camera analysis and this camera seems like a speed demon, I can’t wait to try one. 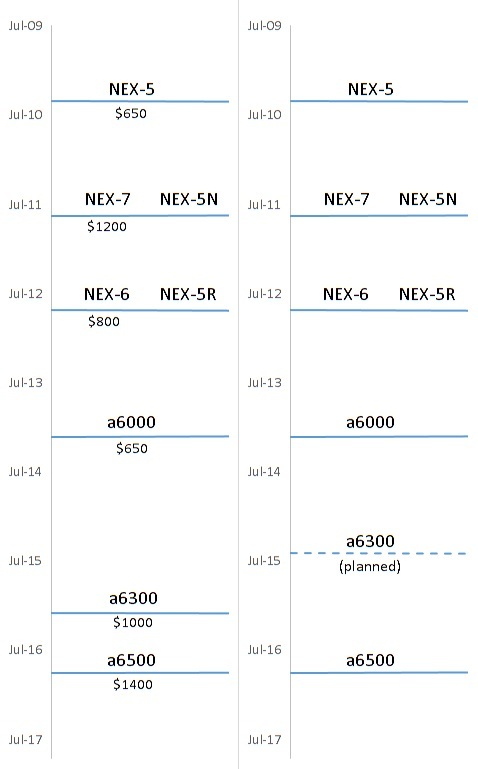 Many have complained about how quickly the Sony a6500 followed the a6300, but John took the time to put together a graphic showing Sony’s planned release dates compared to their actual release dates. It seems that the original delay of the Sony a6300 was not allowed to push back the release of the Sony a6500. This is an interesting revelation because it means Sony is rapidly developing cameras without the desire or ability to postpone releases. Hopefully we will see the Sony a7 III soon. This entry was posted in Sony a6500, Sony RX100 and tagged Sony a7 III, Sony a7 Mark 3, Sony RX100 V. Bookmark the permalink. Trackbacks are closed, but you can post a comment.